This exquisite painting was produced during the reign of Akbar (1542–1605), the third Mughal emperor of India, who had ascended the throne at the age of fourteen and under whose direction imperial art and architecture reached an unprecedented efflorescence. The painting illustrates a scene from the romance Layla and Majnun, one of the most popular poems of the late medieval period. The romance was first written by Nizami (c. 1140–1203), one of the greatest Persian poets. This excellent example of early Mughal court painting combines the bird’s-eye perspective and the representation of nature typical of the Safavid painting tradition, with the softer and more volumetric forms, naturalistic colors, and spatial organization preferred by Indian court painters. 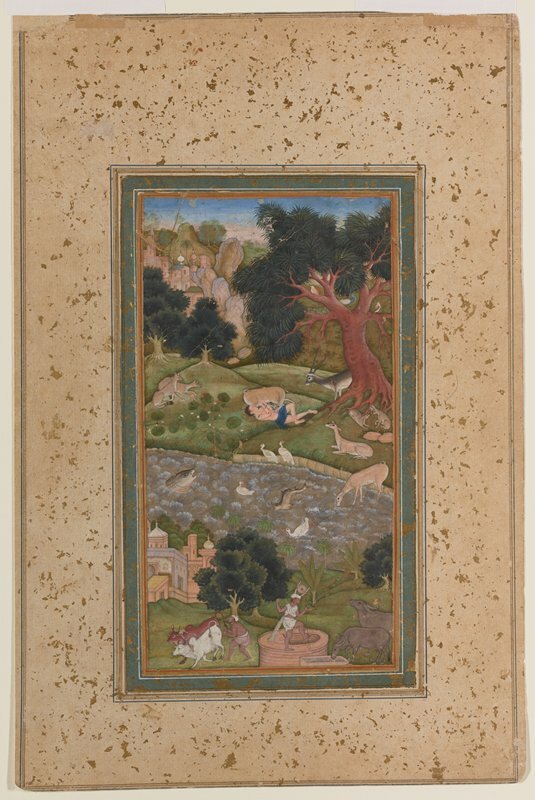 The painting depicts the nearly drowned hero, Majnun, rescued and revived by wild animals.